The Spanish educational system will require certain changes in order to achieve the Bologna objectives for the European Higher Education Area, including with new activities and roles for both students and teachers, who must assume new skills that will affect concepts and attitudes related to the teaching and learning processes. 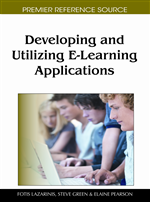 This chapter describes the authors’ experience in designing E-learning methodologies for the teaching of accountancy in the Business Administration Degree Course at the Polytechnic University of Valencia. The chapter’s methodology designed for teaching accounting, is based on PBL (Problem Based Learning), compiled with Internet based technologies. The authors analyze its use and evolution in two accounting subjects in the first and the fourth year of the degree. The conclusions obtained from the statistical treatment of the results show that there is a direct correlation between the use of an active E-learning model and obtaining satisfactory exam results in the subject. The Declarations of the Sorbonne (1998) and Bologna (1999) established a starting point for the harmonisation program of the different European higher education systems. The process called for the adoption of a single European degree system to improve the employment prospects of graduates and to make the European higher education system more competitive internationally. Harmonisation of the European Higher Education Area (EHEA) is expected to be complete in 2010. In Spain, the Organic Law of Universities passed in 2001 foresaw the complete integration of Spanish higher education into the EHEA and since then radical changes have taken place in the structures of Spanish undergraduate and postgraduate degree courses. In this context, achieving the Bologna objectives and establishing the high standards of the European Higher Education Area requires the reform of the educational system, the development of a professional profile and roles and activities different from the traditional ones for both teachers and students (Monereo, Pozo, 2003). The latter will have to take on new competencies that will influence their concepts and attitudes on teaching and learning within the framework of learning projects (Zabalza, 2003). Students will also have to take a leading role in the educational process by adopting significant and cooperative autonomous learning methods. The process will doubtless require a profound change in the mindset of the dominant culture of both students and teachers, with a higher degree of cooperation between both, aimed at improving learning results. Teachers will have to select the appropriate methodologies to achieve the required results, using as a reference the professional academic profile and the characteristics of training in skills (Argüelles, 1997; Cañibano, 2008), as well as the structural and organisational settings in which they will be carried out (class size, space, educational organization, etc.). This paper describes the teaching experience acquired by the authors in designing E-learning methodologies for application to one of the social sciences (Ballestero, 1980), i.e. Accountancy, in the Business Administration degree course at the Polytechnic University of Valencia. The teaching methodology is based on Problem Based Learning (PBL) and intensive use of Information and Communication Technology (ICT) provided by the computer-based Educational Platform of the University. The experience involved two accounting subjects considered to be among the most important in the first and second cycles, respectively, of the degree course, involving a large number of students. In both cases, students were free to design their own individual learning systems. The fundamental objective of this work is therefore to evaluate the results obtained from the teaching-learning process in the subject of accountancy in the Business Administration degree course by the application of ICT-based teaching methodologies. The analysis of the results obtained shows that there is a direct correlation between the students who opt for an active learning model from the teaching methodology described here and those who achieve satisfactory results in the subject. A description of the innovation in teaching the subject of Accountancy by the use of ICT. An evaluation of the level of acceptance of the teaching method by students of the first and second cycle, respectively. An evaluation of the suitability of the proposed teaching method according to the results obtained by students and the cycle involved. The work consists of three different sections: the first describes the methodology designed by the authors to teach the subject, its evolution throughout the academic years in which it was put into practice and details of its implantation.